Fresh off an air-clearing series of meetings having to do with interim head coach Jim Boylen being an overbearing dickweed, the lowly Bulls took the floor Monday night looking to reverse course after a historic beatdown. Their opponent, the Kings, is another team that was supposed to spend this season mired in the Very Bad portion of a multiyear rebuild, but somehow they have now lapped the Bulls and are halfway to respectability, while the Bulls are true crud. The Bulls were actually up 11 points at halftime, but the second half went 63–33 to the Kings, with the Bulls totaling more turnovers (14) than buckets (12). A glass-is-half-full take says the first half was an encouraging sign of what Boylen’s style can draw out of his players; a glass-is-half-empty take says the players, satisfied that they’d demonstrated their capabilities, let up off the gas and shrugged their way through a blowout finish. I suppose those aren’t mutually exclusive. Certainly we can all agree that the 6–22 Bulls are terrible. 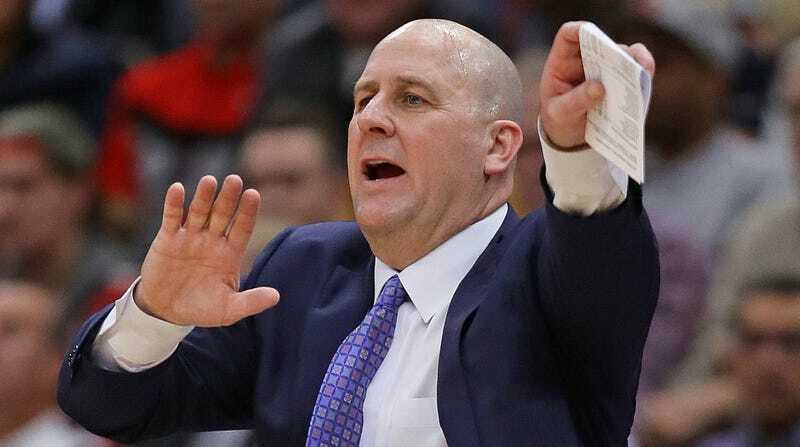 I am very much looking forward to Boylen being the second Bulls head coach to be fired this season.